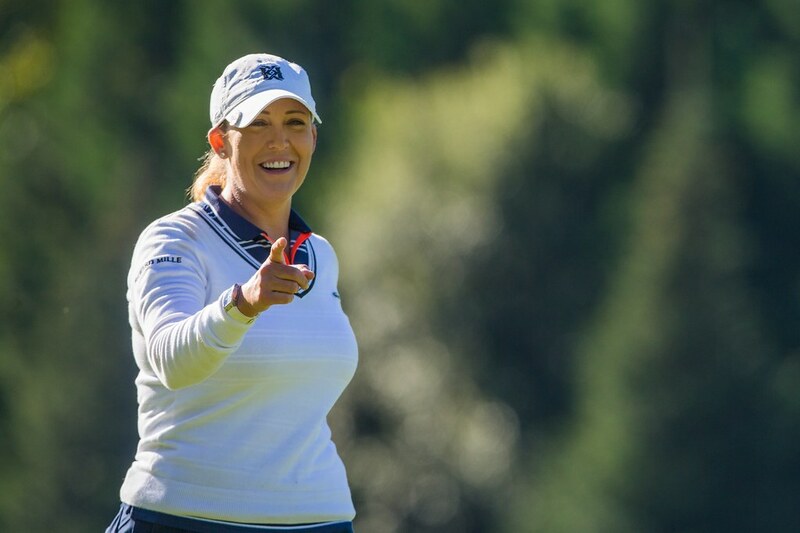 American Cristie Kerr finished her third round in style on Sunday morning when she holed her second shot for eagle on the par-4 18th from 136 yards, using an 8-iron. After picking the ball out of the hole, she looked up to the heavens under perfect clear blue skies and gave a nod of the head. She said on Thursday that she was playing for a friend she lost to cancer two days before the tournament, as well as to celebrate the life of LET member Cassandra Kirkland who passed away in April, through the LET’s charity birdie pledge. Kerr resumed her third round from the 10th tee on Saturday morning and posted a two-under-par 68, which included a pair of birdies on 14 and 15 as well as an eagle on 18 for a back-nine of four-under 31 and a 54-hole total of 16-under-par. Anne Van Dam, who was in solo second going to the 18th tee, hit an enormous drive but then three-putted from 15 feet to slip into a tie for second with Ursula Wikstrom and the two-time event champion Azahara Muñoz on seven-under-par, giving Kerr a nine-stroke lead heading into the fourth and final round.